Grizzly Peak Fly Fishers (GPFF) is a non-profit, volunteer-based, active participation fly fishing club founded in 1982. Our club meets on the second Tuesday of (almost) every month (7:00 pm to 9:00 pm) at the Kensington Community Church in the San Francisco East Bay – 52 Arlington Ave, Kensington, CA 94707. Our membership encompasses Kensington, Berkeley, Oakland, El Cerrito, Albany, Alameda, Richmond, and other East Bay communities, as well as places beyond! 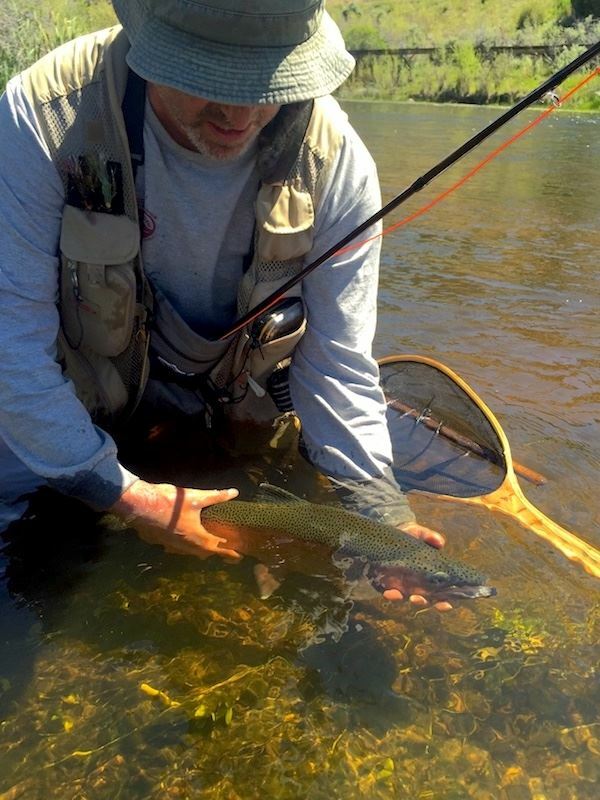 Our mission is to enhance your fly fishing experience through education, fly fishing outings, fellowship, skills development, and environmental awareness. We are an inclusive group and welcome fly fishers of all skill levels and backgrounds. We offer monthly meetings with excellent speakers, outings to some of the most outstanding destinations in California, and beyond, opportunities to learn to cast, tie flies, build rods, and improve your overall fishing skills, access to a library that includes the latest fly-fishing books and videos, and an informative monthly newsletter. While meetings are open to anyone, only members are entitled to participate in outings, borrow from the library, receive our monthly newsletter, and attend some of our skills sessions. Our annual dues are $40. We are dedicated to the development of your fly fishing experience and to the conservation of our fly fishing resources. GPFF has been the East Bay club where fly fishers of all levels can find a home. Join us at monthly meetings to hear guest speakers, fish with other club members on a variety waters and assist with conservation efforts. Sorry, you must be a member to view our forums. Why not join today? Striped bass on a Clouser. Thanks, Leo! 18 brown caught deep in a hole in the Miracle Mile on the East walker. August 2017. Photo by Lourdes Challco. Monster brown caught on the East Walker, March 2017. Photo by unknown person driving by who pulled over to see what was going on. Sometimes frozen finger tips and long drives pay off. Monster brown caught March 2017. Photo by unknown person. Beautiful 21" Rainbow caught in the Miracle Mile on the East Walker. May 2016. Photo by Gabe Kaplan. Miracle Mile, April 2017. Photo by Gabe Kaplan. Deep holes on the McCloud Conservancy hide big fish. Roger W.
One of the Gem Lakes, Little Lake Valley. No, it wasn't raining. That's the Brook Trout rise. Reaction after a fisherwoman's first fish -- Ellen L.
Adam W. gazes down, past Mount Morgan, into the depths of Little Lake Valley, near the top of Morgan Pass. Adam W. and Ellen L. rest after our hike in to Long Lake. Marke E. deploys a dry upon the chalk stream-like Upper Owens. A Yellowstone cutty in full glory. I'm not telling where this is. The main trail there is a moose trail. It goes straight into the lake. For those who persevere, there are some nice Yellowstone Cutthroat. I like trails where the deer and the antelope play. On the way to Cache Creek in the Lamar Valley. No wolves, just buffalo. Good fishin' on Poindexter Slough (Montana). To add photos to the slideshow you must a member and logged in. Go to the Club Photo Album and click on the upload link.